Marking 11 November as Remembrance Day has a long international history. Many countries mark it. In Belgium, where I’ve lived for many years, it’s a public holiday. It does not ‘belong’ to the Royal British Legion nor to the UK, and I feel it has been appropriated in Britain by people who want to make it about the country’s current armed forces. That’s not what it is to me. To me, Remembrance Day is first and foremost about the awful horror, stupidity, and waste of the First World War. Then, by extension, it’s about the Second World War, and the way European civilisation turned in upon itself in fratricidal conflict. That’s what Remembrance Day is to me, and while I respect other people’s wish to make it about something else, something more than that, or something less than that, I reject their wish to impose their interpretation on me and everyone else. My understanding and experience of Remembrance Day is as valid as and arguably historically more valid than theirs. Those who serve in the military are public servants who make great sacrifices for their fellow citizens. In the modern era, they are volunteers, so they have chosen this path knowing that it might entail great sacrifice. However you feel about the state’s use of arms to achieve its objectives, I think this choice by individuals is worthy of respect, and I do respect it. Respect that is forced isn’t really respect, though, is it? So-called “poppy fascism” (by which we mean pressure to conform in wearing a poppy) is, I think, fundamentally disrespectful. It’s disrespectful to people who serve in the armed forces because it poisons public debate around their service; it’s disrespectful to those who so pointlessly gave their lives in the First World War; it’s disrespectful to those who gave their lives in the Second World War to fight *actual* fascists, and defend our fundamental freedoms; and it’s disrespectful to all the other public servants who make sacrifices on a daily basis, even if those sacrifices are (thankfully) rarely mortal. Given my personal views set out in the previous two paragraphs, it can hardly come as a surprise that my understanding of Remembrance Day is intimately bound up with my passionate belief in the European Union. To me, the EU flag is a far more potent symbol of Remembrance than a poppy. To me, Brexit is an offensive act of disrespect for the sacrifice of millions in past European wars. As soon as the idea occurred to me, I felt I had to make this EU poppy and show people that I had made it. This is the very opposite of trivialising Remembrance Day. Brexit trivialises Remembrance Day. And to the author of the Spectator piece who feels that talking about Brexit politicises Remembrance Day, I can only say that Remembrance Day is and always has been profoundly political, and his article only serves to prove that. This entry was posted in Brexit, EU, Europe, history, knitting, politics, UK politics on 12 November, 2017 by Chris Kendall. About 18 months ago I taught myself to knit. It’s something I’d been meaning to do for a long time, I had always seen it as a beautiful craft and a potentially very satisfying creative outlet. With a bit of encouragement and coaching from my sister, I took the first tentative steps, and I quickly fell in love with it as a hobby. It has lived up to all its promise and I’m still completely hooked. Speaking of hooks, this summer I diversified into crochet. It may not be everyone’s cup of tea, but for me it’s the perfect pastime: creative, contemplative, manual, organic, solitary, but also social. I’ve previously posted a knitting pattern on this blog. A couple of weeks ago I was asked to knit a pair of socks by a previous happy recipient who wears them in bed. He wants another pair but, he specified, he wants a pair decorated with the EU stars. I duly delivered the first of the pair and at the time of writing I am working on the second. I tweeted a picture of the first and it found its way into the Brexit camp’s echo chamber. They don’t like it. It offends them, and they began queueing up to tell me about it. I cannot begin to tell you how gratifying I find this. I knit because I love to, and I knit the EU flag because it’s a way to make a statement, isn’t it? It won’t change the world or reverse Brexit, but it feels good. But oh my God it feels so much better when I know it annoys Leavers! A number of people on Twitter have asked me for the pattern. This isn’t going to be a pattern as such, but the following should give you all you need to knit these yourself, it’s actually very easy. It’s based on a standard sock pattern. I got mine from a really good book which I recommend, Knitting Socks by Ann Budd. Buying a book may be overkill but what I like about this book is that it gives you a basic formula that you can follow for any size sock in any size yarn on any size needles, once you have the gauge. I have the Kindle version on my phone for quick consultation. I also recommend following Youtube tutorials the first time you attempt socks – a very good one I’ve used is the one below. Once you have your basic sock pattern, then the rest is straightforward. Get your blue and yellow sock yarns (I use Regia 4-ply) , knit a sock as you would normally in a blue yarn but switch to yellow for the heels and the toes (for the toes I do two rows in alternating yellow and blue before switching to just yellow, and I start these at the beginning of the decreases). Then, for the star pattern, at about twelve rows beneath the ribbing I simply do the stranded colour work following the pattern below. Again, Youtube is full of helpful tutorials if you’re new to colourwork. Sizing can be tricky so it’s important to get the gauge right. I’m using Regia 4-ply sock yarn with 3.5mm needles and 64 stitches in a round, so I have room for 8 stars following the pattern above. It’s relatively simple to adapt the pattern to a smaller sock size either by reducing the number of stars and increasing the space between them, or by adapting the star pattern. Doodling new knitting patterns is what meetings are for, right? There’s also an app for that. My 64-stitch round on 3.5mm needles gives me a sock that is pretty loose even on my size 11 feet so you might want to go with something smaller. Be careful with the colourwork – if you strand too tightly, your sock will lose elasticity and will be hard to put on; strand too loosely and a toe might get caught in a floater (a ‘floating’ length of yarn in the colour not being used – mitigate this by twisting the two coloured yarns around each other every four or five stitches). Experience is the only way to get this right. Just experiment. The traditional way to knit socks is on four double-pointed needles (or three if you’re American). I’ve switched to using the magic loop method which I really recommend, it’s a lot quicker and neater. Obviously, this pattern can easily be adapted to hats or scarves or mittens or gloves or anything else. If creativity strikes, please share your results in the comments. I’ve put a gallery of my knits up on Flickr, and I intend to keep adding to it. I’d be delighted to hear from other knitters especially the craftivist type. This entry was posted in Brexit, EU, knitting, politics on 8 October, 2017 by Chris Kendall. 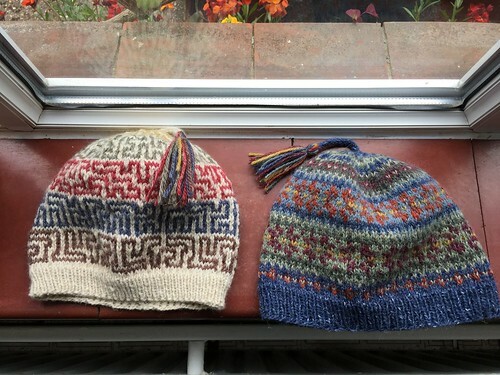 Knitting pattern: the fairisle euroberet! Calling all members of the Bresistance! Show your love for Europe with this unisex fairisle euroberet! May be worn Citizen Smith-style, Che Guevara-style, or René-off-of-Allo-Allo-style – however you wear it, it’s guaranteed to troll a kipper. Disclaimer: this is my first attempt to write up a pattern, and it won’t lead you by the nose. I am assuming some experience with stranded colourwork and basic increasing/decreasing on the part of the reader, and that you will be comfortable adapting the pattern on the fly to suit your needs and address any errors. My beret (pictured at top and below) was improvised, and so is this pattern. If you don’t recognise an abbreviation, you probably won’t want to knit this pattern (but if you’re curious please search them on youtube where there are hundreds of great tutorials). The beauty of a beret, knit from the top down, is that you don’t have to be too fussy about sizing. The only bit you have to get right is the very final four rows of ribbing which have to fit the head you’re knitting for. If you get to the end of the pattern and you find you’re still a bit too big, just add another decrease round or two. The beret is knit in the round from the top down (beginning with an i-cord). Start using DPNs and transfer to circular needles as appropriate (once I’d complete the i-cord I transferred to a single set of long circular needles and used the magic loop method throughout). At the top and the bottom of the star section, there are long floats of up to 15 stitches, I recommend trapping the floating yarn every five stitches using a twist. Be careful to avoid making your floats too tight or the fabric will pucker. 3. Arrange stitches evenly on 3 DPNs (2 stitches on each) or transfer to long 3.5mm circular needles (to knit in the round using the magic loop method). Next row is Row 1. 4. Row 1: k6, PM. 6. Now, knit rows 3-50 following the pattern with row 3 at the top (click on the thumbnail below). Each row in the pattern is repeated twelve times to complete a single round. SM (slip your marker) at the end of each round. At its maximum breadth, you will have 192 stitches per row. On increase rows, M marks the increase. Use any increase you like – I used kfb, m1l and m1r. For the decrease rows, a backslash / marks decrease stitches (I used k2tog). Chances are your head is smaller than mine, in which case you might want to repeat row 50 once or even twice until you arrive at a size that fits you more comfortably. 8. Cast off in rib using an elastic bind-off (eg http://slipslipknit.com/?page_id=92). Weave in ends. This entry was posted in Brexit, EU, Europe, knitting, politics and tagged brexit, EU, knitting on 20 February, 2017 by Chris Kendall. Brexit negotiations: how is the UK doing? What exactly is a “soft” Brexit? Why can’t a rich country act like a rich country? Boris “Outs” himself as a fan of electoral reform – or is he just a massive hypocrite? Where next for social democracy in Britain? Should a pro-European vote ‘leave’? What’s a europhile to make of the Cyprus bail-in? The EU: a union of state bureaucracies?